Here's a list of what we've got to offer these days. See the Order Form for details about how to obtain these splendid items. 38 Minute Video Produced for the CBC, this new video mixes songs from Tamarack's "On the Grand" album with stunning scenery, archival footage and the band's narration. The band was James Gordon, Alex Sinclair, and Carole LeClair. 48 Minute Video Produced for the CBC, this video features songs, stories and scenery from Tamarack's 1989 Rideau Canal concert tour. We travelled the length of the canal by houseboat giving concerts along the way and the CBC came along for the ride (and the endless beer from our sponsor Sleemans). The band featured James Gordon, Alex Sinclair, and Melanie Doane. 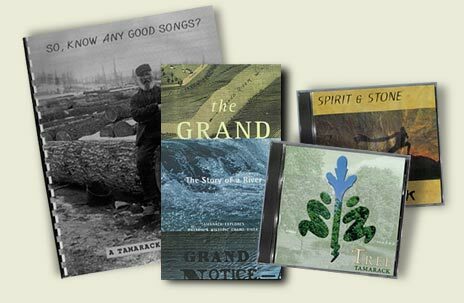 Over 80 of Tamarack's recorded songs in a handsome-looking volume with sheet-music, lyrics, chord charts and anecdotes.